In 1964, Bell Laboratory scientists Arno Penzias and Robert Wilson were trying to detect sources of radiation that might potentially harm satellites. Their data, however, showed background noise from a microwave signal corresponding to a temperature of approximately 2.7 K that appeared to be emitted from every direction. This apparent aberration was recognized by scientists at Princeton as remnant radiation from the earliest observable moment in the evolution of the universe, now called the Cosmic Microwave Background. 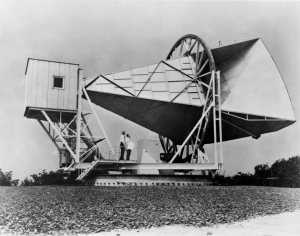 Arno Penzias and Robert Wilson with the Horn Antenna used to discover the Cosmic Microwave Background. Their discovery was a tremendous one for astrophysics, providing a glimpse of the earliest observable moment in the evolution of the Universe. The Cosmic Microwave Background, or CMB, is ancient radiation leftover from a time roughly 380,000 years after the Big Bang when the hot, dense plasma that permeated the Universe cooled with the expansion of space. At a nearly uniform temperature of 2.7 Kelvin, the CMB fills the entire Universe and can be detected everywhere we look. If the human eye could see microwaves, the entire sky would glow with nearly equal brightness in every direction. A map of the Cosmic Microwave Background. The different spots of color correspond to different temperatures and in turn, different densities. Why is the map different colors? Why is the map of the CMB an oval?